FT. MYERS, Fla. — Enough with the click-bait silliness, from Pablo’s gut to Cespedes’ cars to the Marlins’ new rules on facial hair. The true meaning of spring training was on display Saturday, on display in a dim, narrow walkway between the Twins’ clubhouse and the field. 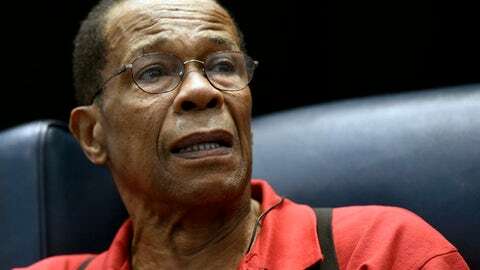 Rod Carew quietly joined hands with his wife, Rhonda, and walked slowly past the batting cages. Moments later, the Hall of Famer emerged on a crispy, windy, sun-splashed morning, taking the field for his 53rd straight spring training, the one he never thought he would live to see. The Twins, gathering for their first full day of workouts, were not in standard uniform. 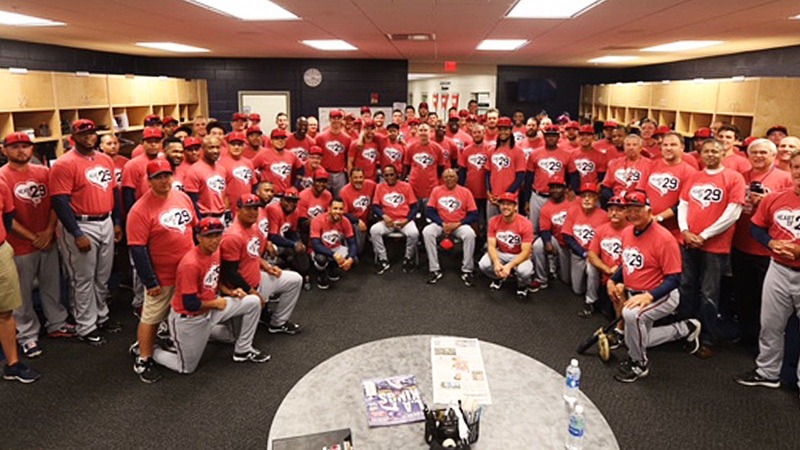 Every player — every team employee, in fact — wore red-t-shirts featuring a white heart and the words, “Heart of 29” in blue letters. No. 29, you see, suffered a massive heart attack on Sept. 20. Spent 47 straight days in five different hospitals. Survived only due to something called a Left Ventricular Assist Device (LVAD), which he had implanted during surgery to help his failing heart function. Carew, 70, said he is about four months away from becoming eligible for a heart transplant; the procedure cannot take place until six months after surgery. His LVAD is hooked up to battery packs and a small, portable computer, making it appear as if he is wearing a flak jacket under his uniform. Yet, there he was Saturday, standing on the field watching drills, observing hitters in the batting cage. There he was, borrowing a blue Twins pullover from his old teammate and roommate, Tony Oliva, to help him stay warm. Others, though, were less reserved. Twins manager Paul Molitor, a native of St. Paul., Mn., said he grew up rooting for Carew, a seven-time batting champion, before competing against him as a player. Early Saturday, during the Twins’ first meeting of 2016, their relationship took another turn as Molitor introduced each of the team’s alumni coaches — Oliva, Hunter, LaTroy Hawkins, etc. Molitor saved Carew for last, wanting to make sure that his players understood who Carew was, and why his presence at camp carried such meaning. The players responded with a standing ovation. Carew, upon his arrival, told Molitor and the Twins’ coaches, “I’m lucky to be alive.” He was smiling when he said it, Molitor recalled. But he meant every word, and in typical Carew fashion, he’s showing his gratitude by helping others. “Heart of 29” isn’t just a t-shirt. 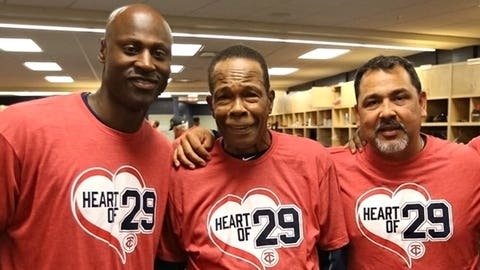 It’s a year-long campaign to raise funds for the American Heart Association, initiated by the Twins and the Carews. The team’s new alternate red home jerseys on Friday nights will include special sleeve patches honoring Carew and the campaign. “I can only tell you guys, ‘Go get your hearts checked,’” Carew told reporters. “We just lost another friend of mine, Tony Phillips, about 10 days ago. Go get your hearts checked. It’s not expensive. And if you go to an imaging place, they’ll tell you right away. Carew, who lives in Southern California, said he had three goals after undergoing surgery: To leave his hospital by Christmas. To attend TwinsFest the final weekend of January. And to make it to spring training. Mission accomplished, on all three counts. Rhonda actually surprised Rod on Saturday, showing up for his big moment. Rod initially walked right past her upon leaving the clubhouse. He then asked how she got there, considering that he had taken their rental car. She informed him that the Twins arranged for her ride. Carew described it as a “full day but not a full day,” saying that he normally will “soft-toss” to hitters in the batting cage and even throw to them more vigorously. Maybe tomorrow for those activities, he said. On Saturday, he simply was happy to be in uniform again. Carew during TwinsFest in January. He gave Oswaldo Arcia tips in English and Spanish. He got into his stance to demonstrate mechanics to Danny Santana. He snuck up on Eduardo Escobar and whispered something about cats, knowing Escobar is terrified of those animals. Escobar jumped and briefly ran away. Carew said he actually is walking six to seven miles a day, chuckling that Rhonda is his “drill instructor.” He takes plenty of medication, jokes that his LVAD makes him bionic. But he is completely serious about his latest mission — saving lives. “Don’t take your ticker for granted,” Carew said. Every day is a blessing, every day at spring training a gift.